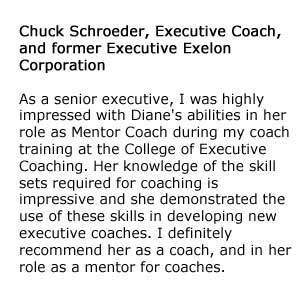 As a senior executive, I was highly impressed with Diane’s abilities in her role as Mentor Coach during my coach training at the College of Executive Coaching. Her knowledge of the skill sets required for coaching is impressive and she demonstrated the use of these skills in developing new executive coaches. I definitely recommend her as a coach, and in her role as a mentor for coaches.